We are planning a Family Camping Weekend at Camp Dickenson in Fries for September 11th – 13th and we hope you will mark you calendars and make plans to attend. There will be camping available for Friday and Saturday night. There are 10 sites available and unlimited tent camping available in the grass. A sign up sheet is in the Lobby at the Information Desk. Meals: Friday night you will have dinner on your own, Saturday night we will share a covered dish fellowship meal together. Please bring food and drinks to share. Sunday, we will have a picnic lunch with hamburgers and hot dogs. Please bring side dishes, desserts and drinks. There are sign up sheets for food items at the Information Desk in the Lobby at OOTBWC. Sunday we will not have services in Hillsville, but, we will worship at Camp Dickenson at 10:30am at the River Shelter and have a River Baptism. Following the baptism, we will share a picnic lunch together. 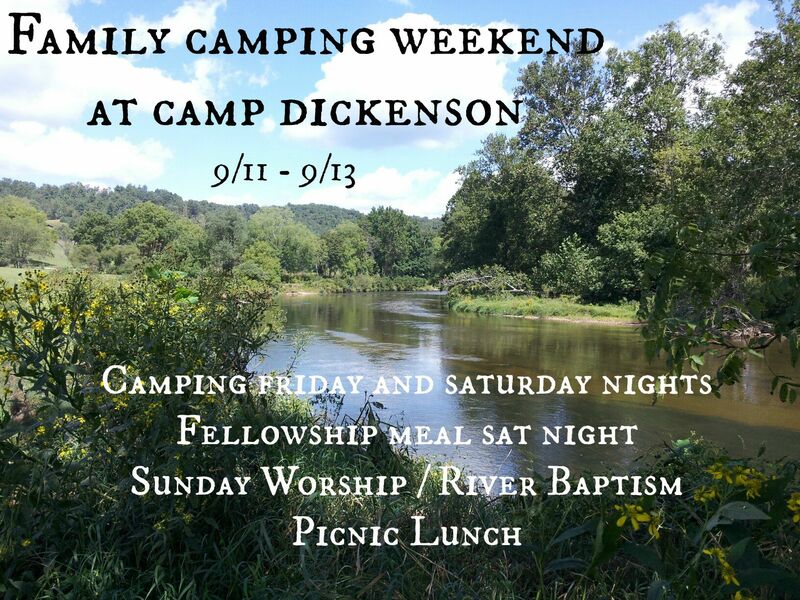 Come join in on the fun and fellowship and spend the weekend with your church family enjoying the river and worshiping God at Camp Dickenson. If you would like to follow the example of Jesus and be baptized on Sunday, 9/13 in the New River please contact Pastor Ronnie at ronnie24317@yahoo.com.